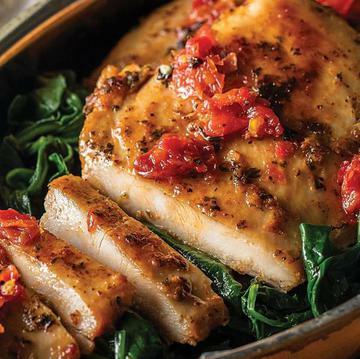 These boneless, skinless, chicken breasts are already precooked. They may be thawed, sliced and served cold.�From Frozen:�Bake: Preheat oven to 400�F. Place chicken breasts on foil lined baking sheet. Heat for 12-15 minutes.�Microwave: Place chicken breasts in microwave safe dish. Cover with paper towel and heat on HIGH for 2-2 � minutes.�From Thawed:�Bake: Preheat oven to 400�F. Place chicken breasts on foil lined baking sheet. Heat for 8-10 minutes.�Microwave: Place chicken breasts in microwave safe dish. Cover with paper towel and heat on HIGH for 1-1 � minutes.�Broil or Grill: To warm, preheat your broiler or grill. Warm chicken breasts for approximately 3 minutes per side.�Contact Grill: Grill 2 � -3 minutes.